Taking inspiration from champagne bubbles and sequin dresses, NUIT ET CONFIDENCES is a glamourous, elegant & refined fragrance, described as a sensual, musky, oriental. A fragrance with many intriguing elements starting with a fresh opening of Bergamot with a contrast of Black Pepper, leading into a sensual heart of Frankincense & Tonka Bean with an irresistible base note of Vanilla and Musk. Presented in a beautiful ombre effect bottle; using midnight blue hues, with the added fun touch of a silk pom-pom. 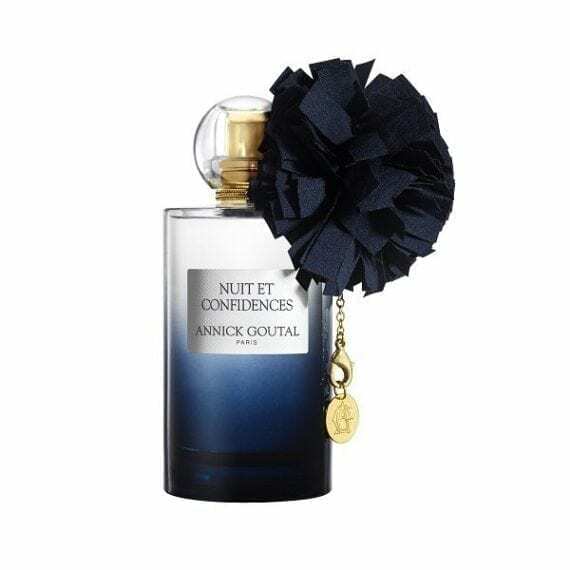 NUIT ET CONFIDENCES is an elegant and feminine fragrance with fun-loving inspiration. Available in 50ml & 100ml Eau de Parfum Spray. This fragrance is so beautiful, inspired by champagne bubbles and sequin dresses it really is just stunning, when first sprayed you get top notes of bergamont and black pepper, then it dries down to make a sweet vanilla with hints of white floral. The perfume lasts all day on my skin and is worth every penny!